The Peter J. Owens Award—named after longtime San Francisco benefactor of arts and charitable organizations Peter J. Owens (1936-1991)—honors an actor whose work exemplifies brilliance, independence and integrity. 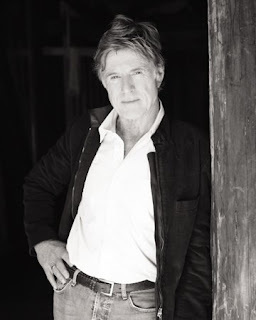 This year's recipient Robert Redford joins such previous honorees as Angelica Houston, Geena Davis, Danny Glover, Gérard Depardieu, Tim Roth, Harvey Keitel, Annette Benning, Nicholas Cage, Sean Penn, Wynona Ryder, Stockard Channing, Kevin Spacey, Dustin Hoffman, Chris Cooper, Joan Allen, Ed Harris, Robin Williams and Maria Bello. 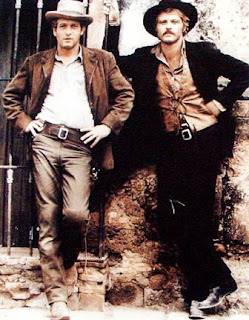 The onstage tribute to Redford included a clip reel, an onstage conversation with Phil Bronstein, and a spanking new print of Butch Cassidy & The Sundance Kid, celebrating its 40th anniversary. 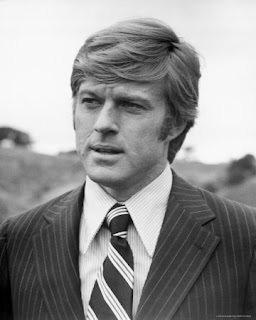 After listing Robert Redford's filmography, Leggat claimed, "Tonight's honoree has no equal in post-war American cinema. He stands alone. He's peerless. Not only as a brilliant, beautiful and talented actor; but, also, he has distinguished himself as an excellent director, as a tireless and selfless environmental and social activist, and as the creator and guiding light of the Sundance Institute, which for the last 28 years has been the most influential film organization in America and has been an inspiration for filmmakers and film culture around the world." Propelled by roaring applause and a standing ovation, Robert Redford took to the stage to converse with Phil Bronstein. Phil Bronstein: I feel especially privileged to be here with someone who is responsible for a movie that actually made journalists look good, All The President's Men. Can you make another one of those? 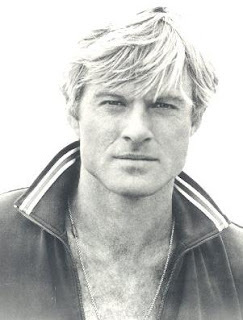 Robert Redford: Not at the moment. Bronstein: When you see yourself on the big screen, what goes through your head as you watch yourself in a film from 40 years ago? Redford: That's the third time 40 years has been mentioned. I'm still trying to adjust to that. This is going to sound strange—and I don't mean it to sound strange; it's just a strange fact—but, I don't look back. There are some films I've made that I've not seen other than in dailies or the premiere. But once that's done, I've always felt that the idea is to look forward and to not look back. Whatever you've done, when you do it, it doesn't really belong to you anymore because you're in the entertainment business. You're an actor. Your job is to provide—as best you can—entertainment for an audience and once the film goes to an audience, it belongs to them. Therefore, I'm okay with letting go. Sometimes I've gone too far with that. There are certain films I've not seen. 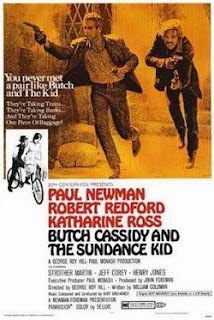 Butch Cassidy I've not seen since its opening. I'm still trying to grasp that it's been 40 years. I remember when the film came out and I saw a rough cut. George Roy Hill showed me a rough cut. I thought the film was doomed. It had a song in it in the middle of nowhere and there wasn't even any rain in the film. I thought [Hill] had lost his mind and I didn't know what was going on. I ended up listening to the song for six months on the radio. What did I know? Bronstein: I hear you did your own train stunts? Why? 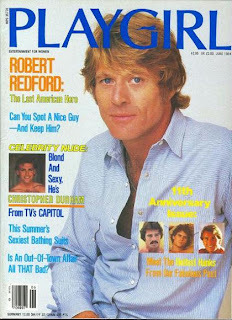 Redford: Because I liked it. It was fun. I was an athlete as a kid and I enjoyed doing that kind of thing. Always have. And so when I was in the film, I said, "Look, I want to do what I can." The same thing was true in The Natural (1984). I played ball and I wanted to do that. I enjoyed it. It wasn't like it was a chore. It wasn't like I was trying to prove anything. First of all, I thought it had to do with the character. You're not just a character in a close-up; you're a character through and through. Therefore, you have to inhabit a character completely. So whether it was a long shot of running through a rice field or a long shot of any kind, I wanted to do it because I felt that I move the way I move, and I'm moving the way the character moves, and—if you put a stand-in in there—he's not going to move exactly the same way. 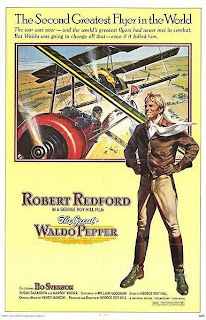 Bronstein: You also did the wing walking in Waldo Pepper (1975)? Redford: I was out of my mind. Bronstein: You've issued some cautionary comments about not falling in love with your parts. You've talked about how you were a ballplayer, you were an athlete, so The Natural must have been a fabulous experience? Redford: It was. At one time in my life when I was very young I wanted to be a ballplayer. Kent Williams was my hero. I wanted to pattern myself after him. Then, of course, life goes on. 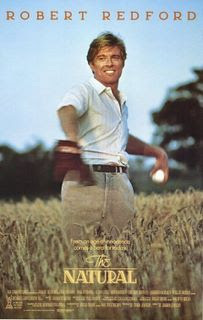 When I had the chance to make that film—it took a lot of years to get that made because the studios did not think baseball was box office; they felt politics was box office—so I just wanted to do what I could. I wanted to do my own pitching and hitting. I was able to do that and I loved it. 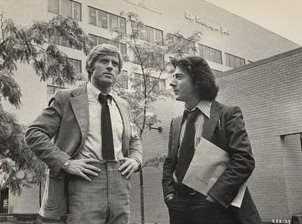 Bronstein: You mention politics and, of course, All the President's Men is near and dear to my heart. 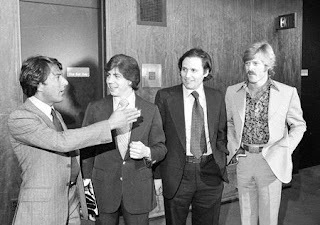 In fact, I called Carl Bernstein in anticipation of this interview. I know Carl so he took my call; otherwise, I would have called Woodward, which would have been a more natural conversation. I said, "What can you tell me about Robert Redford and All the President's Men?" He said, "There was never a shooting script. 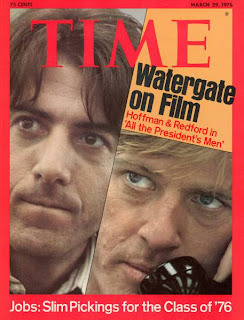 Redford would call Woodward every day and Dustin Hoffman would call me every day and ask, 'What would you say in this circumstance?' " He said the whole thing was improvisational, which is not something I would have guessed from watching All the President's Men. Redford: That's not really true. I like improvisation a lot. I believe in it, always have believed in it, that was one of the most exciting, fantastic things for me. I've always enjoyed it but I don't like doing films where it stands out like a sore thumb. Where you're suddenly stepping outside the frame of the film and you're saying, "Look, I'm being real all of a sudden." For me, improvisation has to be incorporated into the film so that it's unnoticeable; it just feels alive and fresh. 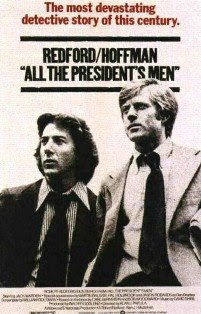 There was some improvisation but All the President's Men was certainly scripted. We had a hard time getting the script in the very beginning. The Post was nervous and The Post didn't trust [the film]. The Post was torn. They were attracted to the idea of it because of the issue of celebrity; but, they were also frightened because of the celebrity. They were afraid it might turn into a Hollywood film and there wasn't a whole lot I could do to assure them that wouldn't happen; that I believed a lot in authenticity but they didn't know me, so why should they believe that? They were always hedging their bets. When it finally was clear that they were very anxious about the script—somehow an earlier draft had passed by them and they didn't like it and they started to protect themselves—I saw the project being doomed at that time so what I did was to go to Bob Woodward and I said, "Look, can you help?" Carl Bernstein, who happened to be a very good writer, wanted to write the script himself but I said, "No, no. But what would really help is if you guys could give us your notes about how you did what you did" because, for me, the film was going to be about hard work. If you want to boil it down to some refined point: it would be about just hard work. These guys worked harder than anybody else and that was something that attracted me. The second thing was that [Bernstein and Woodward] seemed like a very odd couple. That was interesting to me too. Finally, it was the notes and both Carl and Bob were very forthcoming and they let us have their notes for all the scenes. For example, the bookkeeper's scene in the film with Jane Alexander, for Carl (Dustin Hoffman) it was like pulling teeth because she didn't want to talk. That was strictly from Carl's notes. Bob and Carl's notes both were so complete that we were able to literally shape whole scenes from the notes. That was a great advantage. In terms of how they talked and how they behaved, yeah, that's true, Dustin was after Carl—he didn't have to go too far for Carl because Carl was pretty demonstrative to begin with; what you saw was pretty much what you got—but, with Bob, he was another matter entirely. He was hiding a lot. I'd say, "Bob, I'm sorry but you're pretty dull. That's fine for your job but not for mine." He'd say, "I know it." I'd say, "Isn't there something weird about you that I can use?" He'd say, "No, I'm really not very interesting. Carl's the interesting one." I thought, "How am I going to get a grip on this character?" And then Bob said something very revealing. I asked one of his friends, "Do you know anything about Bob that's different?" He said, "Well, yeah, he's a pyromaniac." I said, "What?!" He said, "Bob gets obsessed with building fires. Have you ever watched him build a fire in his fireplace?" I said, "No." He said, "Watch him sometime. His eyes glaze over." So I watched him build a fire while we were working and pretty soon our conversation went out the window as he began obsessing about the fire. Then I realized, "Wait a minute, how am I going to make a film about a reporter who's a pyromaniac?" Finally, I asked him, "Can you tell me something about how you work? You're so dogged and relentless." He said, "Well, I had an upcoming test at Yale that lasted two days. The first day of the test I completely blew it. I didn't study. I didn't know the answers and I was making things up. That night I went home and I studied so hard for the next day because I knew I had failed the first test and I knew I had to succeed at the second one. I worked all night and I knew it like the back of my hand. I went in and did the test and—when the results came back—I had succeeded the first day and failed the second. I went to the professor and I said, 'Hold on, this can't be right.' and then he showed me that, indeed, it was right. I realized at that point that I didn't know what good work was." That was my cue: his obsession with overdoing things, researching every detail, was a clue to his character because he was relentless. Also the fact that he wanted the people he was interviewing to see him as flat, non-intrusive, non-aggressive, polite, very genteel, and let Carl play the more flamboyant character. But when it came right down to the final moment, Bob was the one who would go for the jugular and he would do it in a surprising way. To me, that was the cue for the character and how to play him. Bronstein: A pyromaniac in a news room could be a little dangerous. You talk about hard work and actually that's what Hoffman said about you after that experience: that you were the hardest-working actor that he knew. Coming from him, that's a lot. There's a change that took place in your career pretty early on. Particularly in your early TV days—Twilight Zone, Playhouse 90, The Perry Mason Show—and to some extent on the stage, you played mostly killers, dark neurotics, psychotics, and you've said it was great fun. In Downhill Racer (1969)—which was one of your earlier movies—you weren't all that nice a guy particularly; but, you were a winner. 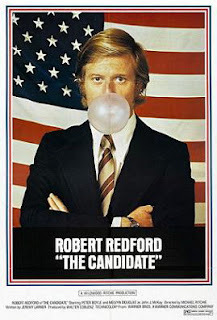 And in The Candidate (1972), an idealist who gets co-opted. But then you went to pretty charming, fairly heroic characters. 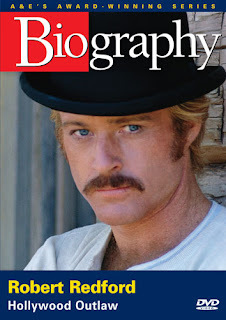 The Sundance Kid in real life was a notorious killer and violent, but charming as we saw in the movie. In Indecent Proposal (1993), I think the character you play was originally written as a creep, a completely immoral guy. Up Close and Personal (1996) was originally supposed to be the Jessica Savitch story but it turned into a great, romantic movie. So when—if it was a conscious decision—did you shift from the darker roles; that different kind of personality? When did you make that decision and why did you make it? Redford: It was not a conscious decision. It was evolutionary in terms of being an actor and wanting to be a complete actor. I started in the theater in New York. I was young, 21. I wanted to experience the full spectrum. For me the exciting parts—I won't say easy—but, the attractive and exciting parts were the villains. They were fun to play and I got very much into them—I enjoyed them—but, I also wanted to do comedy. The first couple of shows I did on Broadway were drama, and television was full of darker characters who were fun to play; but, I wanted to do a comedy and I asked to read for a role in a Broadway comedy. What came back to me was that the producer thought I was too serious. I said, "Well, can I have a chance?" I was living in California at that time and the auditions were in New York and I said, "Just give me a chance to read for it." It was a play called Sunday In New York. The producer said, "Well, yeah. But we're not going to pay for your way back." I found my way there, read, and got the part. That led to two other plays that were comedies. 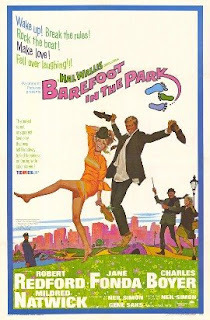 Barefoot in the Park was the last one. That led to me being able to do that in the film. As far as I was concerned, there was never a conscious decision on how I was going to be … charming. No, never. It's playing a part that's interesting to play. These are the characters that I find interesting and they were different. That's why. Bronstein: I read that you had some other against-type characters that you wanted to play? One was Rasputin and the other was the Phantom of the Opera. How'd that go for you? 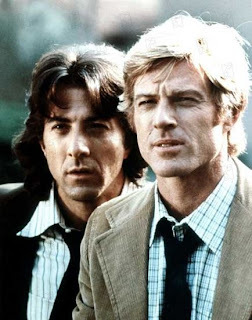 Redford: Obviously, not very well. But that's true. I thought Rasputin was an amazing character. I was riding high on my ego at that time and thought I could do anything so I sent word to Sam Spiegel that I wanted to play that role and he just couldn't believe it. He flew me over to London just to have me come into his office so he could say, "Are you serious?!" I said, "I really am. I really want to do this." He said, "Well, I would be out of my mind and I would lose my position in this business if I allowed that." Anyway, that was that. When I was a kid I saw The Phantom of the Opera and it hit me hard. I loved it. I loved the idea of the obsessive passion of a man who had been damaged in the theater, something he loved, doing the thing he loved, and how it turned him into this Svengali-type creature. But I particularly liked the idea of the mask. It hung with me in my head and I thought, "If I ever have the chance to do something that I want to do, I'd love to play the Phantom of the Opera." Years later, Andrew Lloyd Webber was in L.A. and I told my agent I would like to do that. I wasn't so much interested in the musical—although I thought it was wonderful—but the dramatic idea. I went to see him and he said, "You can't be serious?! [Laughter.] You would wear a mask?" I said, "Yes! And the older I get, the more I would enjoy it." He just couldn't take it in. So that never happened. 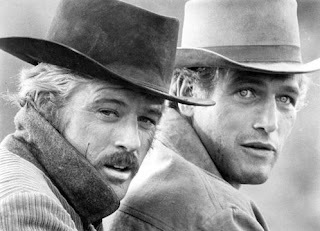 Bronstein: You said about Butch Cassidy at one point that it changed your life. You said, "I can no longer live the way I have been." Rather than assuming all the ways the film changed your life, how was it such a fundamental change? Was it the fame and the celebrity that came with it? Redford: It was that. I wasn't prepared for that. I don't know that anyone ever really is. I've always enjoyed a certain amount of privacy. Not only was that good for my family but good for me personally because—if I spent my time enjoying success and celebrating too much—I would lose the ability to observe life around me. So I wanted a certain amount of privacy; to be able to move around and see life the way it was. [Fame and celebrity] hit so hard. I remember my son James when he was about six or seven. We were eating dinner. [The celebrity] happened really quickly because the film was an inordinate success. We weren't prepared for it. James and I were eating at a restaurant in New York and we used to walk home from the restaurant. At the restaurant, people started to come up to the table. They were generous and flattering. That was the first time that had happened to me. When we were walking home, I noticed that James was walking either behind or ahead of me. Because he was six, that didn't make me too comfortable. Finally, I caught up with him and I said, "Is something the matter?" and he said, "Yeah." I said, "What?" He said, "Why don't those people like you?" I said, "What do you mean?" He said, "Those people that came up to the table, why don't they like you? They wouldn't bother you if they liked you." That was my first clue that this was happening and that it could affect people around me. That was a hard adjustment. It felt good but it was an adjustment. Bronstein: Sidney Pollak said of you, "There's a part of him that likes being worshipped and a part of him that's self-conscious and embarrassed about it." There's a tearing process for which side is winning at the moment. Redford: I'm only human. It's hard not to like [the attention]. But, on the other hand, it's troubling. Bronstein: William Goldman, with whom you've worked many times, tells a story that—after Butch Cassidy—you were performing a prison movie. One of the guards said to Goldman, "My wife wants to sleep with Robert Redford." Goldman said that's when he realized how big things had gotten. Half of the world thinks of you as this guard's wife does. That must be unsettling? You spent three decades walking along being one thing but you still have that inner part of you that no one's seen. You don't know for sure what the public's reaction to your performance will be but you know it's not you. You don't know how long that reaction will last. Chances are, it won't last forever. Goldman said that stars have to live with that madness. How do you—and particularly you because you're so famous and such a big celebrity, yet you've managed to maintain the kind of privacy that to some extent you're talking about—how do you manage the madness? Redford: Well, that's a mixed bag. You don't always succeed but you try. Let me tell you something. When I was younger, there was something that happened to me when this [celebrity] started to happen. First of all, I grew up in Los Angeles. Hollywood, for me, was not the magic end of the rainbow because I was raised in Hollywood and I didn't see the magic of it. I knew at a very early age that there was something artificial about movies. I enjoyed going to the movies like anybody else. I went to matinees as a kid and enjoyed them. I would see famous people around town from time to time. I remember driving down Olympic Boulevard. My grandmother was in the car with me and I was little. I remember seeing this wall—it was either 20th Century Fox or MGM; I can't remember which studio it was—but, I remember seeing what looked like a big sign sitting on top of the wall and it was a big picture of the sky. I looked at that and, wow, it was gigantic. I asked my grandmother, "What's that?" She said, "That's a movie studio." I said, "Yeah, but, what's that big thing?" She said, "I think that's where they shoot war movies. They use that as a background for the sky." I said, "Why would you do that when the sky's right there?" I couldn't understand and that was the beginning of understanding filmmaking's artifice. I was a kid like anybody else going to movie theaters, picking up girls, having a good time, maybe make fun of the screen to show off to her, lots of dumb things like that. Hollywood was not a place you wanted to strive to get to. I, in fact, wanted to leave it. I wanted to go somewhere else. So when this [celebrity] happened and I could feel the shift, I remember thinking that what was happening was that I was beginning to be treated like an object. I remember putting three notes in front of my desk about the three stages I had to be aware of. First of all, you were going to be treated like an object. Next stage, if you weren't careful you would begin to behave like an object. The third and final stage, you would become an object. I felt I had to be careful and aware and work against it as best I could. That's not to say there isn't something enjoyable when you're in it. It's given me a lot of enjoyment in my life. Flattery is something undeniably good. How can it not be? But you have to be careful. It's like shadow boxing. You got to be careful you don't get too close to it. Otherwise, it can eat you up. Bronstein: You've also had to live up to an interesting stigma. A good chunk of the world is familiar with you and your career and—although you really have done a remarkable job of keeping your private life private—I think very few of those people who know about you and your career would sit there and think, "Hmmmmm. 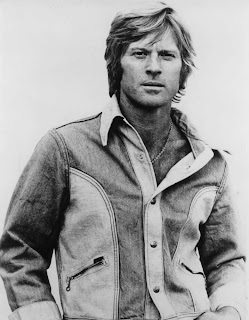 Redford. Now there's a guy who's had to overcome a lot of adversity." Streisand's character in The Way We Were (1973) says of your character, "Everything came easy for him." I saw an A&E biography of you where it referred to your "seemingly charmed life." Does this seem unfair to you that everyone assumes that you've had an easy life? Redford: That's what happens. When people don't know who you are, they're going to be making assumptions about who you are and, unfortunately, if they're going to base it on what they've seen on the screen, then you're likely to be misjudged. I did not have a charmed life. I grew up in a lower working class neighborhood in Los Angeles. We were one of the few Anglo families in a Hispanic neighborhood. Everybody was working. Fortunately, people were unified in the community because the country was off at war; but, it was not an easy life. I had jobs in oil refineries, all kinds of jobs, boxing in grocery stores, a carpenter's apprentice, and so forth. But I didn't see it as poverty. I didn't see it as being deprived. It was just that the "better life" seemed "over there." There were hardships. You lose family members. You lose dogs that you've trained. You see them get run over by a truck before your eyes. That may seem like a small thing but to a little kid, seven or eight years old, it's a big thing. Throughout life I've had other adversities that we don't need to get into now; but, no, I would not say it was a charmed life. It was something I worked for. Bronstein: Your looks, however, can be alternately described as useful and helpful; but, also a curse. You've said about your role in The Way We Were that, originally, you weren't interested because you didn't want to be the actor who was standing around looking handsome. 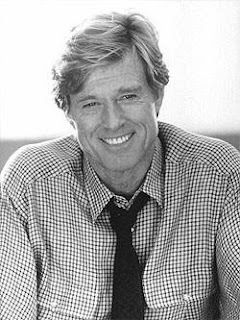 Redford: It's nice, all this flattery about how I look; but, I wish it would have happened when I was a little younger, when I was in high school and had freckles. I had turned down The Way We Were. In the original script it felt to me that the character was cardboard; he was just there to look good. I said to Sidney, "That's not what I want to do. You can get someone else for that." We talked about it. He was pushing hard. Sidney deserves credit for pushing me to do the film. What we agreed on, I said I would like to play the part if there was a shadow part of him, something dark underneath that, and maybe that was the fear that he was not as good as people thought he was because of the way he looked. That, for me, was a more interesting character. Because he looked a certain way and he wrote something good when he was young in college, didn't mean he was going to be a great writer…. Bronstein: You also did pictures that involved prisons, Brubaker (1980) and The Last Castle (2001). 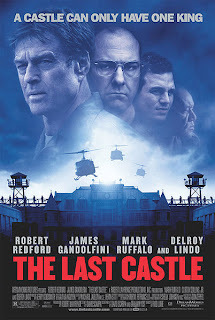 The prisoners in those movies were kind of the good guys; they weren't bad guys. You caught some criticism for that. Redford: Did I? Brubaker was based on a true story. It was about a warden who went down there to uncover something by going in as a prisoner. He thought, "I can't do the job unless I see it from the inside." He uncovered the corruption. He did the job he was hired to do and got fired because he did the job he was hired to do. He became an embarrassment to the governor. When he uncovered all these bodies, it was clearly a liability against the administration. So he was fired. I thought that was a really interesting story. It wasn't that the prisoners were good guys, it's that they were being abused by other prisoners who were hired as guards. It was a brutal situation that he had to try to correct. Bronstein: I won't mention the years, but you've done almost 40 movies…. 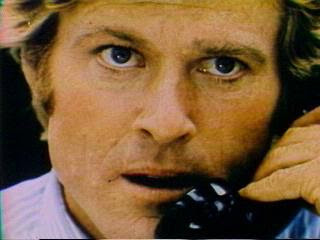 Redford: You still mentioned the number 40. Bronstein: What haven't you done that you still want to do? Redford: A musical instrument—the flute. When I was a kid, music was in my family. It's in my children. My grandfather was a violinist and a cellist and played in a band. So music was in my family and it was an urge that I had. I didn't have much as a kid. This guy came to the neighborhood offering free guitar lessons. He came to our house and he said, "Listen, I'll give your son a guitar lesson free. If he likes it—and I think he has some inclination towards it—then we'll talk about lessons and they won't be very expensive." So he gave me a guitar and adjusted it to my being left-handed. I loved it. I thought it was the best. Things seemed to be going okay. My dad came home and my mom told him what had happened and he said, "Oh, the guy's a shyster. It's a con job." So it never happened. Therefore, maybe that was my shot. I guess that would be my one regret. I love music so much, I would have loved to have played music. Bronstein: You have the next 40 years to do that. At this juncture, Bronstein opened the session up to the audience. 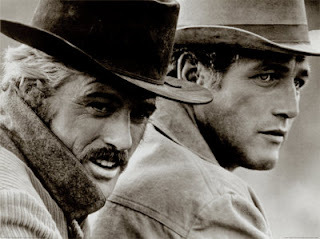 Redford was asked about Paul Newman. He responded with evident emotion, "He was the best. We became very good friends. Very very close friends. I think our closeness was so strong that I wouldn't want to do a disservice to Paul and our friendship by talking too much about it, except to say that it was a hard loss. We were going to do a project together, which didn't happen because of [his death]. Yeah, I was sad. I spent time with him before he passed away. It was one of the best relationships I had, certainly working in the business, and I think he lived a life that mattered. I respect that." 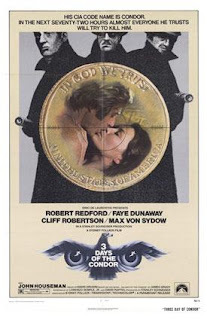 Jan Wahl lamented that she hasn't seen many films from Hollywood lately on the par of Ordinary People (1980), Three Days of the Condor (1975), or Out Of Africa (1985). She asked if Redford could comment upon mainstream Hollywood movies today and if there was anything he would like to see done differently in how movies are made today? Redford responded, "It's different. It's radically different. It's in a seismic shift at the moment. Change is inevitable. It's the only thing that succeeds really. We know that. You're either with it or you're not. We're having a hard time right now figuring how to be with the changes being driven by new technology. It's also being driven by a focus on the youth market. That's why anime and animation are so much stronger and more popular. Hollywood is a business and that's all it is. It's a good business; but, it's a business and therefore they're going to follow the money. If the money goes in that direction—certain kinds of comedy, certain kinds of film, franchise films and so forth—that's what it's going to be. More independent types of film began to disappear a long time ago and that was one of the reasons why I wanted to start Sundance. During the '70s, I enjoyed being able to go between the two poles of larger films—which meant all Hollywood or mainstream films, films I'm proud of, but big budget films—but, the ones that gave me joy were the smaller films that were a little bit more risky. "Which leads me to comment on The Candidate. I wanted to produce my first film. I wanted to tell stories about the America that I believed in. I remember as a kid being constantly told when I was playing in sports that it doesn't matter if you win or lose; it's how you play the game. I found that was a lie and that everything mattered whether you won or lost. I wanted to make that statement in a film through entertainment. I wanted to do a trilogy on the subject of playing and that the winning would be a pair of pictures at the end of each film. Each film would end with a question. We picked three subjects that were big enough societally—sports, politics and business—and the first two of that trilogy were made on a very low budget shot in a documentary way. The Candidate was made here for $1.5 million. Downhill Racer was made in Europe and it was largely improvised in documentary style. But at the end of each film, the character who has strived throughout to find his way had—somewhere along the way—lost his way. At the end the frame would be, "Wait a minute. What's happening?" and then you're out. 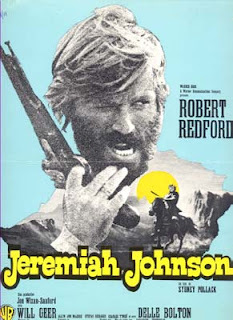 The third one I couldn't get the script done; but, throughout the '70s, films like Jeremiah Johnson (1972) were not normally going to be made. But if I made [a big] film, then I could say, "Okay, we can make this film, as long as it's low budget." So I was already into independent film. "When 1998 came, you could see that the industry was changing. Hollywood, per se, was becoming more centralized, was following the youth market, and jettisoned the films they made in the '70s that were more independent. Then you had cable coming on strong, you had video coming on strong, so you could see it was changing drastically. What I did was a selfish thing. I thought, 'I like these films that are more independent. Maybe—in putting something back—I could come up with a plan or an idea that would help other people just coming in continue to make movies and sponsor that. New voices; I'm interested in new voices.' I thought that could be the nonprofit Sundance. In evolutionary steps, one thing leading to the next, we had the lab at Sundance with very little money to start with and no mainstream support. The films that came through there weren't getting into the marketplace. They had no place to go. That led to the idea of showcasing the films through the festival. Meanwhile, time is changing all throughout the '80s. I always loved documentaries, which were influential to me. The idea was mainly to use the festival to create a platform for documentaries. They were not getting a fair shake in the mainstream. Globalization started to occur, borders dissolved, and a lot of us could go international. "As these things came up, I would use what we had built to expand. That led to getting the channel and now the cinemas. We have the Sundance Kabuki Theatre here in San Francisco. They were not meant to be just a chain of theatres to show movies that are just out of the festival but more of a community project where the space is used for other things that draw community. 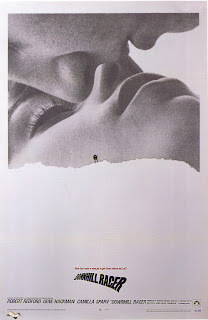 The idea was that it would be a theatre made by people who love film for people who love film. The idea was to expand that in the community and increase the awareness of film and give audiences more of a role in participation. As these things came, we just seized them and took advantage of them. This was not an idea that I had in 1980. It happened in stages along the way. That's a windy way of giving you an answer; but, the business now—it's hard to tell you what it is. It's in such a state of flux. The studios aren't studios anymore the way they were when I came in. Online has changed things. Distribution is completely different. Things are in flux and—what I'm banking on—is supporting content, developing content with new people, new voices and making sure that we have a mechanism to keep that alive."